Photograph of the Carrollton. Credit: Maine Maritime Museum. 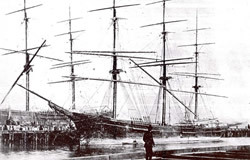 The Carrollton was built in 1872 by the Arthur Sewall Shipyard in Bath, Maine. Bath-built down-easters were some of the most celebrated commercial sailing vessels of their day. Sewall ships, though not the fastest, were proven economic winners in the long-haul maritime trades of the mid and late 19th century. In the midst of her career in the Pacific lumber, grain, and coal business, the Carrollton was accidentally lost on December 26th, 1906, when she ran bow-on onto the reef at Midway while en route from "New South Wales" Australia to Honolulu with a load of coal. All of her crew were saved, but the vessel was a total loss. 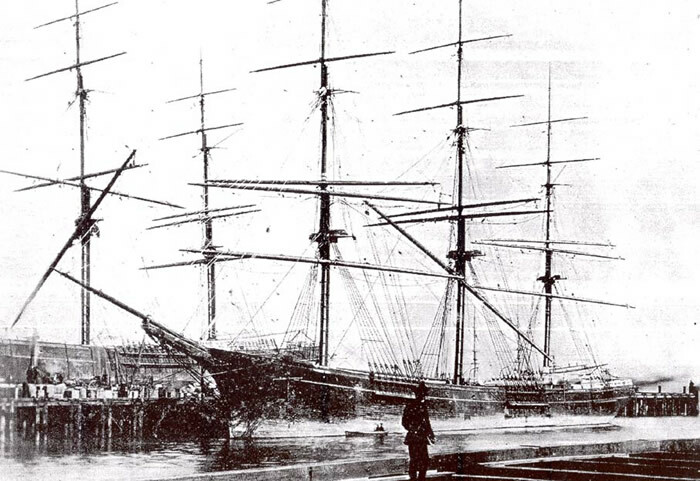 Carrollton is one of eight other Sewall-built sailing vessels lost in the Pacific. 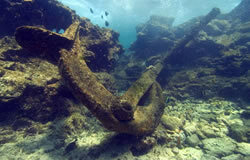 Today, a large variety of artifacts from the shipwreck lie scattered over an area almost 1,000 feet long. Anchors, windlasses, anchor chains, fasteners, piping, bollards, glass, rigging, stanchions, sheathing, winches, pintles, gudgeons, an auxiliary boiler, and a portion of the ship's cargo of coal testify to the sea's power to break apart what the best wooden shipwrights once created. 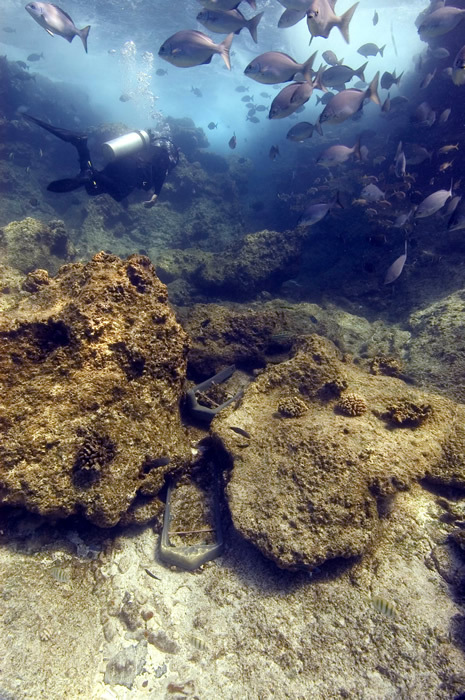 The reef and artifact remains were surveyed by NOAA archaeologists during the 2003 field season and further documented with high definition video footage in 2005. Maritime Cultural Resources Survey Northwestern Hawaiian Islands, NOWRAMP 2002; Prepared for NOAA/NOS by Hans Van Tilburg, 2002. 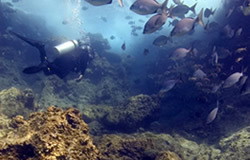 Hans Van Tilburg swims near the reef at the Carrollton shipwreck site at Midway Atoll. Credit: NOAA/Collins. 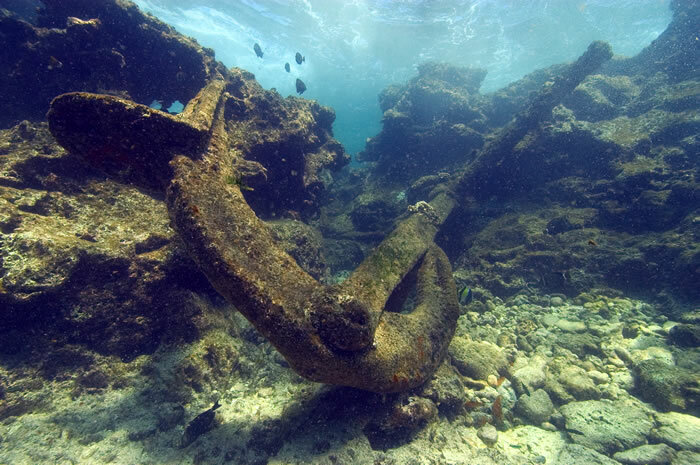 Trotman anchor at the Carrollton shipwreck site at Midway Atoll. Credit: NOAA/Schwemmer.